The 2017 Legislative Session is over. Here’s where we stand. The 2017 Oregon state legislative session is over. With your support—your calls, your emails, and your stories—we were able to accomplish a lot. But in a tough budget scenario, there were also significant missed opportunities. Here’s what happened at the Oregon State Capitol for the advancement of a well-fed and economically stable Oregon. Big picture: we started the session having just learned that Oregon is the only state in the country that experienced a statistically-significant increase in hunger in recent years. This increase was driven by factors like the high cost of housing, childcare, healthcare and underemployment, especially in rural parts of Oregon. Hunger in Oregon remains disproportionately high for people of color, women, and people in rural areas. Oregon also started its session with a $1.8 billion budget shortfall, meaning that new investments in effective anti-hunger efforts would be difficult to come by. On top of that, we faced a federal budget proposal that included massive cuts to food assistance, heating assistance and health insurance. The 2017 legislative session ended on Friday, July 7. Overall, the legislature did well to avoid most of the deep cuts that would have hurt people experiencing food insecurity. There are some reasons to celebrate, but also some clear missed opportunities. Oregon Bans School Lunch Shaming. The legislature ended the practice of “school meal shaming” in Oregon by ensuring that no student should be deprived a meal, be given a stigmatizing alternative meal like a cold cheese sandwich, or have their hand stamped if they don’t have lunch money. The bill passed unanimously in both chambers. Oregon becomes the seventh state to Cover All Kids. All kids in Oregon will now have access to health insurance, regardless of residency status. This bipartisan effort will allow 17,000 more kids in Oregon to be on health insurance. Funding increases to reduce homelessness. Funding for the Emergency Housing Account (EHA) and the State Homeless Assistance Program (SHAP) will be funded at $40 million over the next biennium. This is an increase of $20 million from last biennium, but $10 million short of the Housing Alliance’s request of $50 million. Better access to fruits and vegetables for families participating in WIC. The legislature approved an additional $900,000 (over ‘15-’17 biennium levels) for vouchers to help seniors and families participating in WIC purchase fruits and vegetables at farmers markets and farm stands through the Farm Direct Nutrition Program. While this falls short of ensuring that all WIC families can participate in the program, it is step in the right direction. Additional support for Oregon’s emergency food network. The legislature added an additional $900,000 (over ‘15-’17 biennium levels) to help Oregon’s emergency food network build community-level solutions to hunger and food insecurity. Earned Income Tax Credit outreach. Oregon has one of the lowest participation rates for the Earned Income Tax Credit (EITC). A bill passed with broad bipartisan support that aims at encouraging more people to claim the credit through notification of potential eligibility on a worker’s W-2 form. In a difficult budget year, we worked with coalition partners to successfully protect funding for programs that faced proposed cuts. Farm to School. Both the Governor’s budget and the Ways and Means Co-Chairs Budget proposed eliminating funding for the Farm to School and School Garden program. These proposals were particularly disappointing given that Oregon became the nationwide leader in 2015 in connecting kids in school with locally-grown and processed food. The vote to fully-restore funding for farm-to-school was unanimous. Temporary Assistance for Needy Families (TANF). TANF helps families through hard times while looking for work. There were significant cuts proposed to TANF that would have hurt families with kids—shorter time limits, penalties for people with disabilities, and harsher income requirements for families with relative caretakers, like aunts, uncles and grandparents. Thanks to many calls and emails, funding was ultimately restored. However, 20 years of benefit erosion due to zero inflationary adjustments means far too few families qualify for assistance. General Assistance. Individuals who experience a life-altering injury or disability need assistance during the long period of applying for disability benefits. General Assistance (GA) helps patch that gap, by offering assistance after going through a vetting process. The legislature restored partial funding for GA in 2016, which had previously been defunded. GA was initially slated for a cut in the Ways and Means co-chairs budget, but funding was ultimately restored. Oregon Hunger Task Force. 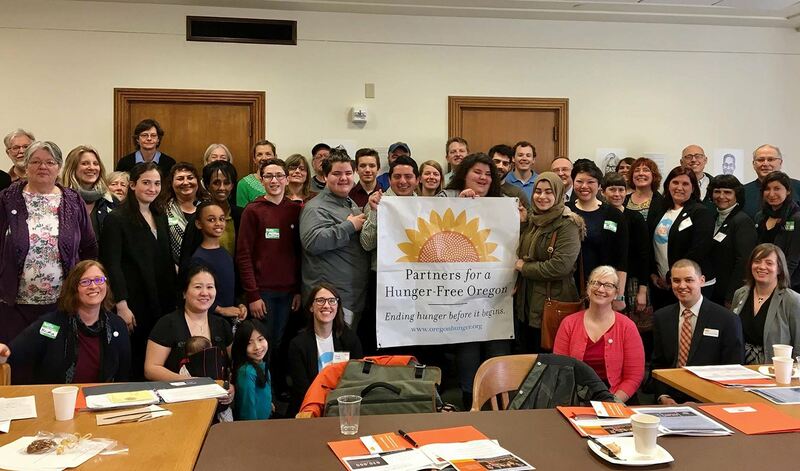 The legislature maintained funding for the Oregon Hunger Task Force, a unique and collaborative partnership of organizations, state agencies, and lawmakers tasked with effectively coordinating anti-hunger efforts. Tenant protections. The legislature failed to pass important protections for tenants. Renters in Oregon are six times more likely to experience hunger than homeowners – higher than the national disparity. High rents are driving an increase in hunger in Oregon. Tenants in Oregon remain more vulnerable than ever for no-cause evictions. Paid Family Leave. A proposal to establish a Paid Family Leave policy was left undone. Low-income families deserve the dignity of being able to care for loved ones, newborns, and in the event of a major illness. Oregon, once again, will wait. Revenue reform. Oregon needs serious investments in education and human services. Oregon also needs fiscal stability, especially when the economy hits a rough patch. Efforts to raise and reform revenue died this year, however. Kicking the can is simply not good enough. Employment-Related Day Care. There were significant capacity reductions to the Employment-Related Day Care program (ERDC). If we as a state are serious about supporting working families, ensuring that low and middle-income families have access to safe, affordable child care is essential. However, the cost of child care in Oregon can exceed the cost of college tuition. We must do better, and this year was a step in the wrong direction. Overall, we feel a mix of gratitude for what we accomplished this session, and frustration where progress was not achieved. We feel a renewed sense of commitment to work for an Oregon that is Hunger-Free—in every school, every community, and in the halls of power. It was a long session. There are too many people and organizations to name and thank individually here… Coalition leaders and partners. Legislators and legislative staff. Oregonians with lived experience of food insecurity who shared stories, called, wrote, and visited elected leaders. Thank you.